19th century Italian Pulcinella (Polichinelle) Wooden Figure For sale in this LOT is very rare hand carved mid-19th century wooden figure of Pulcinella in a lightweight wood, a wonderful form with a essence of curiosity and macabre. The detail and craftsmanship is wonderfully in proportion to the characters personality believed to be a positive outlook on life. Philosophical, eternally melancholic, dreamer as only a representative of the Neapolitan culture could be, Pulcinella has a spirit all of his own. No tensions or despair, his melancholic approach to life makes him coast problems, situations, live adventures and at the end simply getting out of everything, in the same simple manner as how he got involved., A positive approach to life, his winning strategy. Various masks or costumes were part of the character, as its evolution went on, but what got in the imaginary was the white, simple, poor costume with the sugar loaf hat (the “coppolone”), his dreamy way of being, his poetry and simple philosophy. Size in inches: H 17” x W 10” x D 5” Condition: This item is dated mid-19th century therefore expect wear and tear across the surfaces and structure in the form of a patina and aged scuffs across the surface. The hands have aged damage but have been repaired many years ago and are hardly noticeable. Aged wormholes are also present. However this doesn’t detract from the nostalgic and decorative look of this rare antique, it’s suggested to review all the photos provided as part of this advert. Postage: Please get in touch in advance of a purchase if you based outside of the UK to clarify P&P on this item as this varies dependent upon your global location. Global shipping is possible so please view all shipping details as explained. With items of this fragile and rare nature we always recommend recorded/tracked postage with adequate insurance cover. This may cost a bit more, but at least you are covered from accidents that may take place whilst in transit. Disclaimer: At The House of Antiques we try our upmost to relay descriptions and the origin of items sold in our store. We also aim to visualise through pictorial reference the items that are for sold as best we can. The disclaimer is for the customer and makes sure assumptions that can sometimes be made are avoided. We always aim to make sure our customers are not disappointed or misinformed about items that are for sale in our store. For this reason we strongly recommend that relevant questions relating to the item in question are proposed to us directly, additionally all photographs are used as reference and as part of the advertisement. Santos figure, Italy, 19th century. Stunning original patina, unusually large size, with beautifully painted hands and face. Measures: 12" W x 42" H 7. 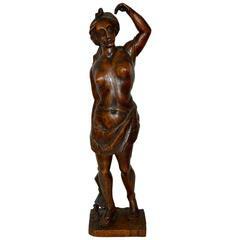 Early 19th century Southern Italian figure carved from fruitwood. Completely original and in excellent condition. 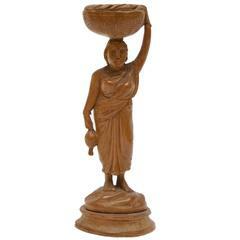 Beautiful carved wood sculpture of a lady. The original 'Lay Figure' mannequin comes from, circa 1850 from France. The manikin has spherical joints. It is fully original, has small defects in the fingers of the figure.